Angela May's Omaha Nebraska Real Estate Blog: Open House!!! $36,000+ in improvements have made this immaculate home like new! New vinyl insulated siding, energy eff. windows & gutters w/transferrable lifetime warranty. Levelor blinds, new front/back drs, carpet & bath floors, shower walls & light fixtures. Charming eat in kitchen w/ceramic tile backsplash, cathedral/beamed ceilings & newer appliances. 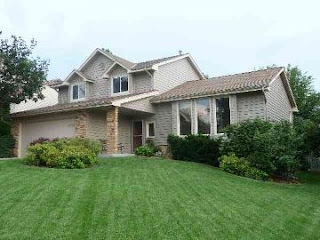 Main flr laundry & finished bsmt.. Beautiful fenced yard w/deck, stamped concrete patio, lush landscaping & shade trees. Sprinkler & 1 year Home Warranty included!